The Rage Three-Five-Two is a full face, 8 spoke design. It offers distinctive off-road styling with a bolt on scratch guard with zinc plated bolt hardware, Grade 8, for superior off-road protection. 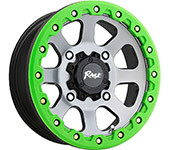 The wheel comes in full painted matte black or gunmetal finish. The Rage Three-Five-Two is offered in popular 14 and 15 inch ATV UTV fitments and features a bolt on center cap with the Rage Wheels logo. The Rage Three-Five-Two is the wheel to set your ATV or UTV apart from the crowd.